Yes, what you just read is undoubtedly true. The new model from Jeep will be coming in 16 powertrain combinations with 6 engine options in over 100 markets worldwide, sounds enthralling, isn’t it? Wait here is a twist out of the more than 100 worldwide markets, US stands to be the only one to be offered with two, namely, 1.4 liter turbo and the 2.4 liter Tigershark, both of them being four cylinders with the first one to be the base model. The standard model will come with the front wheel drive system however company is providing its buyers an option to witch for four-wheel drive. 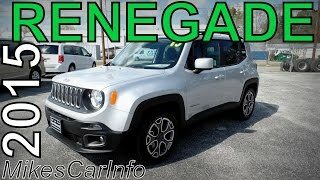 These aren’t the only configurations we have to share about this all new Jeep Renegade 2015, all what the car lovers are supposed to do, so as to know more is, scroll down to know this power packed cute model offering series of options. 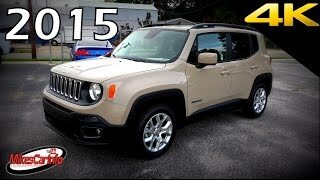 Jeep Renegade 2015 will be offered in four trim levels, Sport, Latitude, Limited and Trailhawk and each of them will have their some or the other unique styles. However we do have a lot to share in interior of Jeep Renegade, like the TFT screen in gauge cluster along with 5.0 and 6.5 inch Uconnect navigation system panels. Black leather work is very well used with the red stitching giving the model a sporty interior. Bluetooth, HD Radio, Sirius XM and USB/AUX input are few other basic amenities offered in Renegade 2015. The roof holds two removable panels further getting stowed in cargo compartment giving the passenger fresh feel of the sky above. Jeep Renegade 2015 exterior falls little over the anime-like look. The grille with its black surround looks really expressive and compliments very well with the rear large D- Pillar and curved rear glass finding their way and joining hands with the taillights. The Renegade overall Length, Width and height comes to be, 166.6, 71.0 and 66.5 inches respectively while the wheelbase stands at 101.2 in. There is vividness in Ground clearance although, for the basic two it comes with 6.7 and 7.9 inches however for Trailhawk it clears at 8.7 inches, a good off road experience in turn is what you can expect. As we mentioned earlier, that the Jeep Renegade 2015 is coming in 16 powertrain combination with 4 engine options. This makes it little bulky to be discussed here and more than it, the same will create confusion, so here we found a solution by discussing the basic two, to be offered in all the markets including US. Let us first talk about the 1.4 liter turbocharged four cylinder; the engine matches with the one found in Fiat 500L but still talking about it, it creates 160 HP and 250 nm of torque mated to six-speed manual transmission. Coming to second, the 2.4 liter Tigershark four-banger, yes the one found in Dodge Cart and Chrysler 200. For this model the engine will be producing 184 Hp and 159 nm of torque mated to nine speed automatic transmission. Both these variant will come with an optional four-wheel drive system. 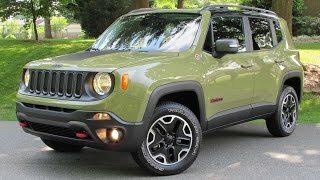 Talking about Price of Jeep Renegade 2015, we’ll have to go through Trim wise; The Sport Trim will come in $17,995, Latitude in $21,295, Limited in $24,795 and Trailhawk to be in $25,995. As far as competitors for Renegade 2015 are concerned, the model might have to battle for existence with the Fiat 500X and Mini Countryman.